Their secret weapon is girl power . . . though it’s not much of a secret anymore. They didn’t . . . for the second year in a row. The Jackson Fork Ranch outfit of Bondurant, Wyo., powered by a sextet of Percherons, had made Calgary Stampede history in 2010 as the first hitch of mares to win the Stampede’s prestigious World Champion Six Horse Hitch Competition. And on Sunday afternoon at the Scotiabank Saddledome, they defended their title in fine fashion – fending off 13 other rigs from across North America, and prevailing in a four-outfit redrive. Victory is worth $10,000 to the Jackson Fork Ranch hitch, owned by J. Joseph Ricketts, whose family also owns Major League Baseball’s Chicago Cubs. “We had a couple of young horses that I thought really rose to the occasion,” said Coleman, the trainer and driver of the Jackson Fork Ranch outfit, who’s originally from Didsbury, Alta. “Last year (the ranch’s first with a six-horse hitch program), we didn’t have as strong a roster as we have now. We were working some horses around, filling some holes. Coleman now has four Stampede titles under his belt, after leading the Strawberry Lane Percherons of Oconomowoc, Wisc., to victory in 2002 and 2004. Second place at this year’s World Champion Six Horse Hitch Competition – the pinnacle of the Stampede’s Heavy Horse Show, presented by Halliburton – went to Red Oak Farm of Kahnawake, Que. Carson Farms and Auction Services of Listowel, Ont., was third, the Rocky Bar Belgians of Esterhazy, Sask., placed fourth, and the Prins View Belgians of Fort Saskatchewan, Alta., were fifth. “How can you not be any happier?” said Ricketts. “We’ve got a group of magnificent animals. A lot of thought went into acquiring them. And we’ve got wonderful trainers, some of the best. And they work. All the time. Twelve-hour days are not unusual. The next major event on the calendar for Coleman and Co. is the annual National Percheron Show at the Indiana State Fair in August. For the 12th straight year, the six-horse hitch final featured live musical accompaniment by the Calgary Philharmonic Orchestra – with 38 musicians, led by the CPO’s resident conductor Melanie Leonard, providing a selection of light classics. A panel of three judges rated Sunday’s 14 entries for conformation, presentation, driving, and reinsmanship. “The judges look for how the horses act as a hitch, whether they move in sync,” said Lorne Hammer, vice-chair of the Stampede’s Heavy Horse Show committee. “They’re also watching the driver. How much control does he have over his horses? You can tell what sort of training he’s put into the horses by the amount of control he’s got to use; some people will muscle the horses, where others are very light on the lines. 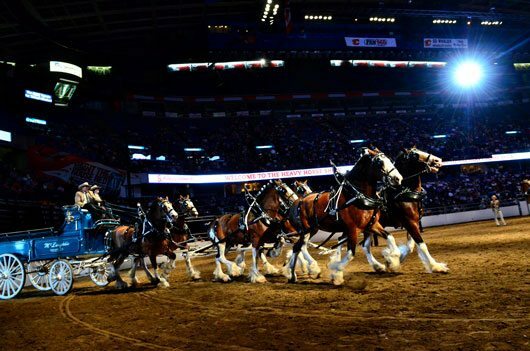 The Stampede’s Heavy Horse Show, presented by Halliburton, sees Belgians, Clydesdales, Percherons and Shires competing in more than 100 classes over four days. Classes include cart-drawn single horses, two-horse teams, three-horse unicorn hitches, and four- and six-horse hitches. The affair concludes on Monday, July 11, with breed Supreme Champions and the overall best in show crowned at 1 p.m. in the Saddledome.